We are 13 days into her Delayed Intensification Phase and she is doing pretty good. Tuesday is her chemo day, Orange Tuesday, and she feels lousy all day Tuesday and Wednesday. She stays on Oxycodine for the pain and zofran for the nausea for about four days. Lizzy's biggest outward side effect from the Vincristine is severe abdominal pain and bone pain. Please pray for this side effect to lesson the next round because typically the side effect of this drug worsens over use. We have been so blessed by God. There are many new experiences we have faced in the past seven months and only through God's grace have we faced these challenges and experiences and with God we will continue on in this journey and we will do it with the same courage and determination that Elizabeth does it with. Have and wonder and blessed holiday. Today is a day we honor America's brave men and women -- fighters for our freedoms. 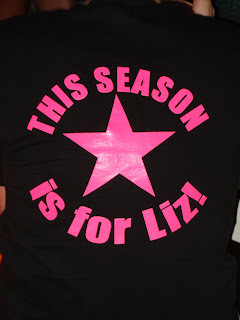 Today is a day we honor Liz -- a fighter for freedoms as well. Freedom from IV lines and shots. Freedom from the healing pukes (sorry Randy). Freedom from daily pills and logs. Freedom from a world of counts and levels and phases. You are on the road to FREEDOM Liz Lothrop! We salute you! I feel like June 9 is right around the corner as each day races by. I know you feel like June 9 is a million light years away. I pray God quickens the arrival of June 9 and for smooth sailing from here to then. I pray instead of side effects worsening, they will ease. Enjoy this extra day off with family and use it to rejuvenate and focus on the freedom we have not only as Americans but in Christ. We're still praying for you every day. I always think of you when I hear the song "The Climb". It's hard, I know, and none of us can understand how hard, but just keep climbing! You're doing a great job. I have been thinking about you today as I know it is your chemo day and can be a rough one (or few!) I am heading out to San Diego this weekend to run the Rock n Roll half marathon with Team in Training. I made my shirt the other day and your name was the first one I put on it and will be thinking of you as I run. You are doing amazingly well...keep up the strength and positive attitude and keep it with you to the end. And hold on to that smile! Sending lots of positive thoughts and energy your way!